PARIS --- After spending billions of dollars, the US Navy has finally abandoned the Littoral Combat Ship concept, saying it will turn the first four LCSs into training ships and that all future vessels will be equipped for a single combat mission. Although deliberately worded to minimize its import, the US Navy statement below is a clear acknowledgement that the LCS concept has been an abysmal failure. But, even as it looks to mitigate the disastrous effects of having ordered a dozen LCS at once, before checking whether they performed as claimed (they have not), the Navy makes no mention of having found the technical faults which have struck four LCS ships this year. In the statement below, the Navy announces it is abandoning the LCS’ most prized objectives (interchangeable mission modules; innovative but complex crewing arrangements) which were supposed to turn inexpensive small ships with small crews into potent combatants in coastal regions. In fact, the ships are very expensive ($562.8 million for each ship, according to the Congressional Research Service. This is about as much as a DDG 51 destroyer, whose last batch cost about $700m each), their small crews are unable to switch mission modules even when these are available, and their crewing arrangements have proved inoperative. By turning the four Littoral Combat Ships it has commissioned to date into training ships, the Navy is also admitting they are operationally worthless. So the LCS concept is a total failure, and the billions of dollars spent so far have been wasted, despite each one having cost about half a billion dollars. All of this should be of major concern as the US Navy has ordered 22 ships under two block buy contracts awarded to the two LCS builders in December 2010, and the 8th was delivered in mid-August. These contracts run until FY2022. This means the Navy is still buying fault-plagued ships designed to a failed operational concept at over a half-billion dollars a pop, which is neither a good idea nor a prudent use of taxpayers’ billions of dollars. Whether, or how, the US Navy reacts to the LCS ballooning problems in the acquisition field will determine how seriously its military and civilian chiefs take their responsibilities. -- on Sept 9, edited for clarity the paragraph on DDG-51 costs. 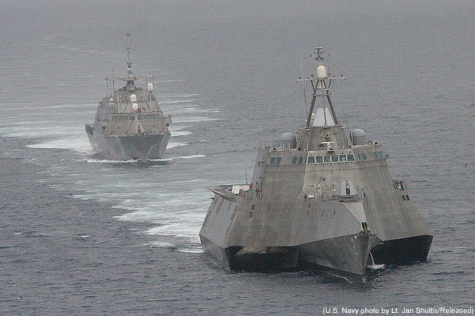 SAN DIEGO --- The Navy announced today it will implement several key changes to the projected 28-ship Littoral Combat Ship (LCS) Flight 0/0+ class over the next five years that will simplify crewing, stabilize testing, and increase overseas deployment presence availability. The projected 12 Frigates will be the next increment of LCS and will use the same manning, training, maintenance and operating concepts as those that have been approved as part of the LCS review. The decision to make these changes resulted from a comprehensive review of LCS crewing, training, maintenance, and operations commissioned in March. While a total of 40 ships have been approved for the program, the Navy Force Structure Assessment still projects the need for 52 small surface combatants that LCS and Frigate address. Beginning this fall, the Navy will start to phase out the 3:2:1 crewing construct and transition to a Blue/Gold model similar to the one used in crewing Ballistic Missile submarines, patrol craft and minesweepers. The LCS crews will also merge, train, and rotate with mission module detachment crews, organizing as four-ship divisions of a single warfare area - either surface warfare (SUW), mine warfare (MCM), or anti-submarine warfare (ASW). Though organized this way, the LCS class will retain the technological benefits of modularity and the ability to swap mission packages quickly if needed. Aviation detachments will also deploy with the same LCS crew, but will remain assigned to their respective squadrons when in home port. To facilitate these changes across the class, the Navy will eventually homeport Independence-variant ships in San Diego and Freedom-variant ships in Mayport, Fla. 24 of the 28 LCS ships will form into six divisions with three divisions on each coast. Each division will have a single warfare focus and the crews and mission module detachments will be fused. Each division will consist of three Blue/Gold-crewed ships that deploy overseas and one single-crewed training ship. Under this construct, each division's training ship will remain available locally to certify crews preparing to deploy. Few homeport shifts will be needed since only six LCS are currently commissioned while the rest are under contract, in construction, or in a pre-commissioned unit status. The first four LCS ships (LCS 1-4) will become testing ships. Like the training ships, testing ships will be single-crewed and could be deployed as fleet assets if needed on a limited basis; however, their primary purpose will be to satisfy near and long term testing requirements for the entire LCS class without affecting ongoing deployment rotations. This approach accommodates spiral development and rapid deployment of emerging weapons and delivery systems to the fleet without disrupting operational schedules. Implementing these changes now and as more LCS ships are commissioned over the coming years will ultimately allow the Navy to deploy more ships, increasing overall forward presence. With the Blue/Gold model in place, three out of four ships will be available for deployment compared with one out of two under 3:2:1. The Blue/Gold model will also simplify ownership of maintenance responsibilities and enhance continuity as the same two crews rotate on a single ship. Single-crewed training ships will complement shore-based training facilities and ensure crews have enough time at sea before deployment. The findings and recommendations of the LCS review will allow the LCS program to become more survivable, lethal, and adaptable as the LCS become regular workhorses in the fleet.